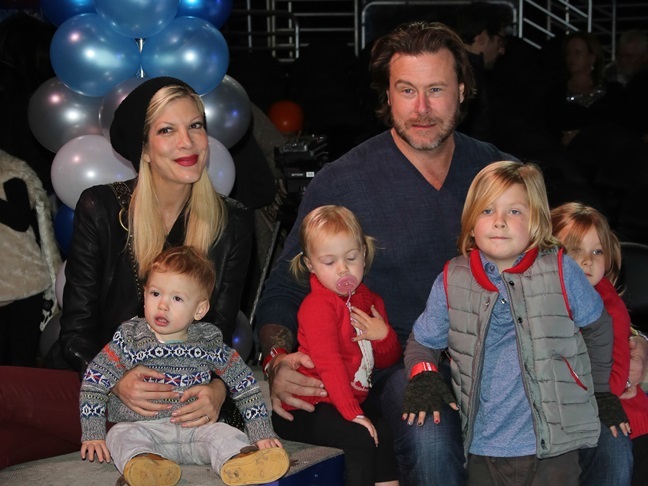 For several weeks there have been rumors floating about, claiming that Tori Spelling's husband Dean McDermott has been cheating on her. The couple has been spending a lot of time apart as he hosts Canada's version of "Chopped", and supposedly during that time away, Dean was seeking the comfort of other women (one of which came forward to spill the story). Tori hasn't publicly acknowledged or denied the rumors, but Dean has entered rehab and is now speaking out. Dean, who is also facing a lawsuit over his upcoming cookbook, shared with People, "I am truly sorry for the mistakes I have made and for the pain I've caused my family. I take full responsibility for my actions and have voluntarily checked myself into a treatment center to address some health and personal issues. I am grateful to be getting the help I need so I can become the husband and father my family deserves." Tori and Dean share four children, Lam, 6, Stella, 5, Hattie, 2, and Finn, 1. Dean is reportedly allowed to leave rehab each day to spend time with his kids. He's also dad to Jack, 15, from his previous marriage. I hate to say it, Tori, but the old saying seems to be true: if he cheats WITH you, he'll cheat ON you. The cynic in me finds the timing of this scandal to be a little fishy since the book release is coming up and their newest reality show "Tori and Dean: Cabin Fever" is set to debut soon. That said, I do hope they are able to work things out for the sake of their kids.